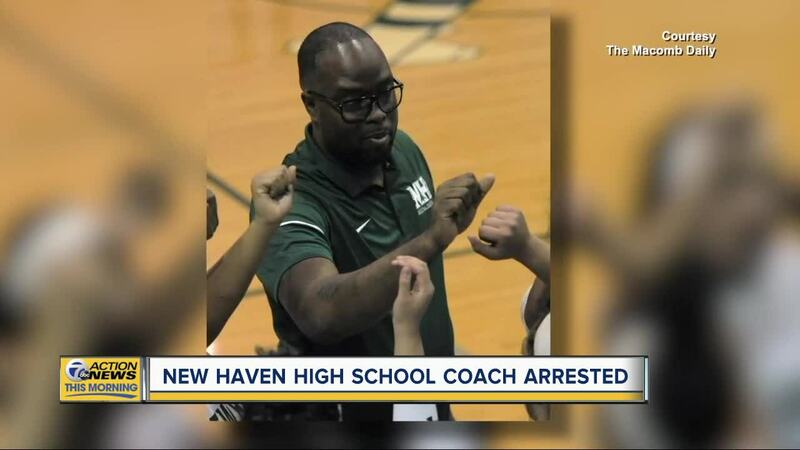 MOUNT CLEMENS, Mich. (WXYZ) — A 43-year-old New Haven High School girls varsity coach has been arrested for the alleged sexual assault of a 17-year-old student, according to police. Latwan Turner, a girls varsity basketball coach, was arrested Saturday, according to a letter from the school district. Turner was found at the Red Roof Inn on 11 Mile and Dequindre with a 17-year-old student. Police said they plan to request charges of criminal sexual conduct. On Monday, Macomb County Prosecutor Eric Smith charged Turner with four counts of third degree criminal sexual conduct for the alleged sexual relationships. According to Smith, the sexual encounters happened at various locations, including inside his vehicle, and most recently, at the Red Roof Inn in Warren on Saturday. Turner was arraigned on Monday afternoon. He was given a $250,000 cash/surety bond. The judge said he could not have any contact with anyone under 18, could not use electronic devices and must wear a GPS tether. Barbara VanSweden, superintendent of New Haven Community Schools, released a letter to parents notifying them of the incident saying that the district is "committed to the safety and well-being of our students and staff," adding that it saddens her to have to write the letter. The coach has been placed on leave until further notice. VanSweden added that the school district will fully cooperate with the Warren Police Department during the investigation. New Haven Community Schools is committed to the safety and well-being of our students and staff. That is why it saddens me that I am writing this letter to you today but it is important that you have accurate information. On Saturday evening, I was notified by the Warren Police Department that the NHHS girls varsity basketball coach Latwan Turner was arrested for sexual assault of a 17 year old NHHS student. I was told that he was taken into custody on Saturday afternoon. Mr. Turner has been placed on leave from the coaching assignment until further notice. New Haven administration will fully cooperate with the Warren Police Department as they conduct their investigation. NHHS principal Will Timmerman and I have agreed that additional counselors will be available this week to support students.. This will be a difficult time for many students and staff but we are committed to providing additional support as long as it it needed. It is also important that we respect the privacy of the families that are directly affected at this time. I appreciate your continued support and cooperation The safety and well-being of our students remains a top priority of the district.